Need recommendations for lightweight, portable baby travel beds? Or perhaps portable beds for toddlers and preschoolers, and other solutions for keeping kids sleeping safe and sound on vacation? 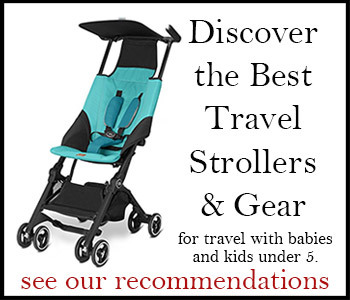 Scroll down to browse truly travel-friendly travel beds, bassinets, and other clever products to help with your next family adventure. Travel beds with the greatest longevity (from minimum age to maximum) listed first. It only weighs 7 lbs.–compare that with other play yards! Add to that its terrific versatility and its hard to find a better travel bed. Use it from birth on up through three years (or more), indoors and out. Breathable mesh panels let you take this to the park and beach just as easily as Grandma’s house (where rubber feet will protect her floors). The self-inflating air mattress works much like a Therm-a-Rest (or backpacker’s mattress), providing good insulation from the cold ground as well as padding from hard floors. An optional UV-protective cover fits over the top to offer protection outdoors (though you’ll have to throw a beach towel or something over the sides for sun protection now that they are 100% mesh (please let me know when you’ve finished thinking that one through, Phil&Ted). At 11 lbs. the Travel Crib Light weighs a little more than Phil & Ted’s full-size travel crib, costs around $100 more, and you probably won’t be able to use it as long (it also doesn’t offer the unzipped side self-access for older children). That said, the easy to assemble BabyBjorn Travel Crib Light is worth it to some parents for the 1-minute (or less) set-up time, space savings when folded and set-up, and eco-certified softer fabrics–every bit of which can be gently washed in the machine. Helps create your “tent within a tent” safely on cold camping trips, and gives a clean, safe place for baby to snooze bug-free, whether indoors or out. Folds into its own carrying case at 16.5″ diameter and 3″ thick, then pops up when needed to 46″L x 28″W x 18″H. The Peapod Plus can be used from infancy well through preschool, and includes a lightweight sleeping bag. In addition to the UV mesh found in the smaller Peapod, the Plus also has roll-down nylon sides for added wind protection. This portable folding infant bassinet sets up in 10 seconds (okay it took us 20 the first time, but…) and features a rigid frame that locks into place, providing a sturdier alternative to some baby travel beds with soft sides. Mesh side panels also allow for better air circulation. Includes a foam mattress and cotton mattress cover. The very popular Snuggle Nest has been improved with new safety features, including ventilation through breathable sidewalls and an optional 1.5″ incline wedge to help elevate baby’s head–very helpful should a little nose get stuffy during your travels. Plays soft music or womb-like sounds and includes a convenient night light you’ll be glad to have when checking on baby in an unfamiliar hotel room. Cover can be removed and washed. Baby travel beds with a built-in, battery-powered night light are few and far between. This co-sleeper also adds an extra measure of protection, buffering your baby from head to toe, making it a suitable sleeping spot for infants both in the “family bed” and out. Great for the airport and possibly even on the airplane. It starts out folded into a travel bag with a shoulder strap and bottle pockets on each end. Then, when you need a clean, safe spot for baby to stretch out while you await your flight, just unfold and the toy bar is already in place.